Does your Springs luxury apartment home frequently look as though a tornado just blew through? You don't have to be an OCD housekeeper to maintain a reasonably clean apartment when you break these six bad habits. No matter what the rest of the bedroom looks like, a neatly made bed creates the illusion of cleanliness. And let's face it, isn't it more satisfying to crawl into a tidy bed rather than one with the covers going every which way? If you really feel you can't spare the three minutes or so to make the bed each morning, at least pull the covers up into place. It's easy to ignore snail mail as it dwindles to little more than credit card offers and local coupons, but stacks of mail can quickly take on a life of their own. Take time once or twice a week to review the mail and deal with each piece immediately, whether you respond or simply toss it in the recycling bin. 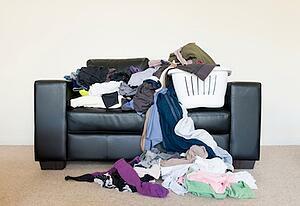 Do you find yourself dodging piles of clothes that have been left wherever they happened to drop? Not only does this create a sloppy apartment, but it also shortens the lifespan of your wardrobe. This habit often results from unorganized closets and dresser drawers. Our spacious walk-in closets provide plenty of room for all of your clothes and accessories to have a home. When you let dirty dishes sit in the sink, the pile eventually snowballs until it's spilling out onto the counter. Before you know it, washing them becomes a daunting and intimidating task. It takes only a couple of minutes after a meal to load the dishes into the convenient dishwasher found in all of our Springs luxury apartments. Is there anything sadder than a houseplant sagging lifelessly over the edge of its container? Light and water are the only TLC most plants need, but if that's still more of a commitment than you can make, get some fake plants or succulents like cacti or echeveria that are virtually self-sufficient. It’s interesting to note that houseplants usually meet their demise as a result of overwatering rather than drying out, so consider investing in an inexpensive plant and soil moisture meter so you know exactly when to give your plants a drink. Everyone has a junk drawer. Chances are you grew up with one in your house, and now you carry on the tradition. While we wouldn't tell you to get rid of it, we will suggest that organizing the junk drawer turns it into a truly useful spot. How did you break a sloppy apartment habit? Share your story in the comments!